Sling bags are my preferred form factor for carrying firearms and trauma gear, as you can access the bag’s contents without setting it down or taking it off. However, sling bags have fallen out of fashion, and it is almost impossible to find one with the size, construction, and durability necessary to do the job we require of them. In the spring of 2014 I was on the hunt for a different way to carry my EDC SBR and trauma gear. Until then, I was using a standard, two-strap backpack. However, I realized that backpacks have severe drawbacks after daily use and some experiments in live fire training like this Dozier drill. 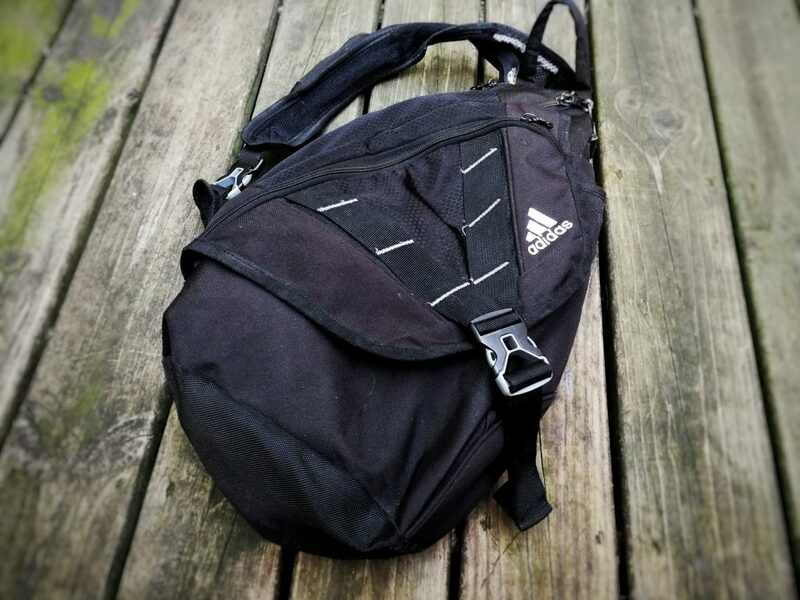 After purchasing and trying out about a half dozen bags, I declared the Adidas Rydell sling bag to be the best sling bag suited for my needs. I still use it to this day, and it’s been a discreet carry option for my vSBR AK47 or AR15 pistol. The bag became difficult to find about a year later. Adidas discontinued the bag. They rolled out the “Capital,” which was the same dimensions but made of inferior materials. They also made some less than ideal changes in the pockets. Still, at least you could buy a bag that was roughly the same size as the Rydell. However, the Capital is also discontinued now. It is not present on the Adidas Web site, and can only be purchased as leftover stock from the usual suspects, like Amazon and eBay. My Rydell is starting to wear out, and I wanted a replacement. Keep in mind that I don’t like buying “purpose built” firearms bags. Most people may not know what a Vertx bag is, but if you do know, then you will be confident knowing there’s a gun inside. I prefer “common bags,” bags that are in general use, made by known manufacturers, that don’t have any connotation to firearms or preparedness. Unfortunately, it appears that no one is making a large format sling bag. The current offerings are smaller, with the largest options being 5″ too short for my needs. Most sling bags sold today are either exceptionally tiny (about the size of a fanny pack) or are only large enough to hold a 10″ laptop/tablet. With a folded length of 16.5″, these obviously won’t do for my AK. At first I tried all the major manufacturers: Adidas, Oakley, Patagonia, Osprey, Mountain Hardware, Timbuk2, Eastpak, CaseLogic, etc. Nothing. I then purchased several foreign-made, no-name bags via Amazon. They had two things in common: the dimensions listed on the product pages were often unhelpful, and they were made of inferior materials. The first problem is somewhat manageable if you are willing to undergo the trial and error that I did. Some product pages will measure the interior (storage) part of the bag, some will measure the exterior. One way to estimate if it will fit your blaster or not is to read the comments. If a rectangular 15″ laptop “barely” fits, there’s no way it will fit a 16 – 17″ folded firearm diagonally. Don’t trust the product description as gospel, and buy bags from a place with an easy return policy like Amazon. The other issue is more insurmountable. More and more sling bags are made out of exceptionally thin nylon. The heavier duty Cordura on my Rydell is wearing after three and a half years of use. I store my firearm inside of a padded 17″ laptop case, so the wear is happening due to the exterior of the bag rubbing against things over time. There is no way that the thinner, more lightweight materials used in today’s sling bags will hold up. Another problem is the zippers on these bags are terrible. Several bags had separated teeth before I used them even once. If they were this shoddy out of the box, I knew they wouldn’t last nearly as long as my Rydell. It’s a good sign if the bag has YKK zippers — unfortunately none of the condenders had them. Every last one went back. I search a few times a month, hoping that a more well-respected brand will put out a quality sling bag again. I haven’t found anything even close to the size and durability of the Rydell (even from Adidas). The only bags that are still in production are dedicated, purpose-built “gun bags,” which I am trying to avoid. Do you have a favorite sling bag for your vSBR or PDW? 9 Comments on "Death of the Sling Bag?" I’ve been reading your site for a few months now and have the same dilemma – finding a bag is nearly impossible. I have a 22 inch OAL AR pistol with a Deadfoot Arms Bolt Carrier Modification that I’ve started carrying. So far I’ve tried the SEEU 32L Oversized Sling Bag. This is slightly too small for my gun, but other reasons make it less than ideal – the shoe compartment protrudes into the main compartment (so there’s basically an emty bag in the compartment where I’d keep a slightly shorter gun) and the fabric seems a bit thin, so this is a no go. Last weekend I used the 5.11 COVRT M4 Shorty and had good success. I even went to a circus and didn’t even get a second look, though people were probably more interested in my two week old daughter; I had diapers and wipes for her and my toddler in te other pocket. I don’t really like this bag for a bunch of reasons, the main ones being the length and that it’s a 5.11 bag. Today I broke down and bought a Sentinel Concepts Revelation II. At the very least, I’ll have something minimally conspicuous to carry the AR in. I run a Maxpedition Monsoon for my 10.5″ barreled AR pistol w/LAW Gen.2 adapter. Shouldn’t bags made out of tarpaulin from trucks are rather popular in Europe. Usually these bags are not big enough for carrying a sbr (except the new carbine conversion kits) but the design can easily be reproduced with fitting dimensions by someone who’s got the gear and experience for working with leather. If you don’t mind the seatbelt buckle, check out the large citizen messenger bag from Chrome. Bombproof construction and definitely not associated with firearms like vertex/maxpedition/5.11/etc. I have one,Outback Canvas Travel Tote, and I am considering the larger Cozmo Laptop Bag. A couple of weighted velcro panels with a Crossbreed holster and 2x mag holders, everything stays in place. With room to spare for 2x IFAK+, 2 bottles of wine, corkscrew, wine aerator, baton, knife and flashlight. For some it might seem gay as a bag of dicks. IDGAS. It works. HTH. I’ve got a barely used rydell if you want it. Actually bout it on your recommendation, I just have other bags that work better with my loadout choices, so it’s just been sitting on the shelf. Take the label off weapon bag, replace with Addidas or Nike or other label? So you rule out a Vertx sling bag, because there are lots of gun guys on Youtube using then to pack guns (and therefore scream GUN to everyone in public) then bemoan the fact that other manufacturers use subpar construction in their packs for gun carry. I’ve heard this Grey Man argument before about 5.11 pants. I don’t think more than .5% of the population have ever even heard of Vertx or 5.11 or any of the “Gun-nylon” brands. No one cares. No one is looking at you while shopping for eggs and evaluating your tactical capabilities. Wear some 5.11 pants, a polo shirt, some sneakers and a Vertx bag and see how many people in a month ask you if you’re a cop/secret service/FBI. Actually, the choice is really simple: Your life may depend on your weapon, and you also need a bag you can depend on for fast access. The zippers must actually work. The bag can’t fail while you are in transit to and from your job; or worse, while you are shopping in a store; (having your SBR poke out of a new hole in the bottom just won’t do). Thus, you purchase the Vertx sling bag. Yes, buy the black one. And next it’s time to ‘civilianize’ the bag so it does not scream ‘gun-guy’. Sew an Adidas embroidered iron-on logo patch on there. You can get those on ebay. A black patch on a black bag will look nice. Next sew on a few ‘racquetball’ patches on there and place a racquetball racket in the bag, WITH the handle sticking out. Wrap the handle in pink grip tape. Make it noticable. At first glance the bag should read ‘workout’ instead of tactical’. Lastly, stuff your normal EDC crap in there, along with your weapon. When people look at you they will see a guy who loves racquetball, and who commutes to and from work. That’s pretty normal, and not at all alarming. Again, people see what they want to see. Your job is to help them see that you are friendly and really into sports; not some ‘gun-nut’ with an SBR in his back pocket.